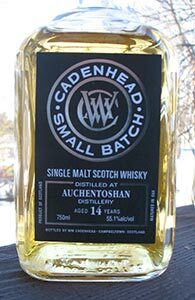 The second in a series of eight reviews of recent Cadenhead’s Small Batch releases. I have to say I’m not the greatest fan of Auchentoshan–not that I’ve had that many–and I’m hoping this 14 yo will be to my liking and at least better than the Valinch (2011) that I reviewed some months ago. Auchentoshan is one of the few remaining distilleries in the Lowlands, producing triple-distilled whisky as was once traditional there. (It is not clear if the other two operational Lowland distilleries whose malts are on the market, Glenkinchie and Bladnoch, have any triple-distilled whisky out there.) I have very little experience of Auchentoshan–I’ve tried the Classic (which does not sport an age statement) and the 12 on separate occasions a good while ago and neither impressed me overmuch. The Valinch is, I believe, the cask strength version of the Classic and, in the US at least, has seen two releases: in 2011 and 2012. The sample I am reviewing tonight is from the 2011 release.